Avoiding what Wilhelm Furtwängler decried as 'the hoar frost of musical routine' has become something of a personal preoccupation. After Bach, Golijov, Piazzolla and Vivaldi from the Britten Sinfonia in Norwich on Sunday we travelled to London on Monday for a rare opportunity to hear an evening of Gavin Bryars' music in the architecturally and acoustically exquisite late 19th century Union Chapel in Islington. Monday's concert was part of the Marginalised festival to raise funds for the Margins Project which works with London’s homeless. The centrepiece of Monday's event was the first London performance for fifteen years of Gavin Bryars' influential 1971 Jesus' Blood Never Failed Me Yet for tape loop and instrumental ensemble. 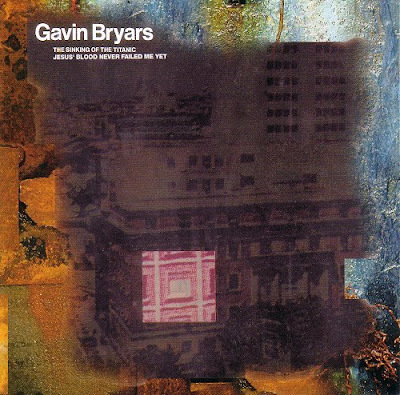 Bryars' understated minimalism and innovative tonality have been constants on the contemporary music scene since the late 1960s. He studied briefly with John Cage after reading philosophy and music at university, and was a founding member of the Portsmouth Sinfonia scratch orchestra, together with Brian Eno and Cornlius Cardew - YouTube audio clip here. Below is the Virgin Classics CD which brought together re-issues of the Brian Eno produced recordings of Jesus' Blood Never Failed Me Yet and Bryars' pioneering 1969 indeterminist The Sinking of the Titanic. The recording of the latter work dates from 1975, and the mix includes the New Music Ensemble of San Francisco Conservatory of Music directed by a youthful John Adams. Jesus' Blood Never Failed Me Yet constructs an instrumental arch over a repeating 26 second loop of a homeless man singing the religous refrain. 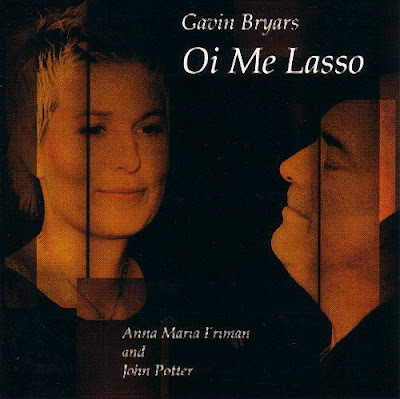 Bryars' original recording, which was made for Brian Eno's Obscure label and is re-issued on the Virgin CD seen above, uses an ensemble of just five musicians, which include Michael Nyman on organ. A longer version for larger ensemble was recorded for Point Music in 1993 and is now deleted. This label was Polydor's abortive attempt to 'do an ECM' in collabaration with Philip Glass and Michael Riesman. Releases on Point Music ceased in 2002 when Universal Music realised a quick win was actually proving to be a very long win; an interesting looking compilation of the label's work titled XVI Reflections on Classical Music was announced for September 2009 release but is not to be found on any of the retail databases. Somehow in the 20th Century an idea has developed that music is an activity or skill which is not comprehensible to the man in the street. This is an arrogant assertion and not necessarily a true one. Five of Gavin Bryars' Laude were sung in the first half of the concert by the voice they were composed for, tenor John Potter. These compact works, recorded on the CD seen in my header image for the composer's own record label, use sacred 14th century Italian texts. They were originally sung in simple settings by musically untrained 'laudesi' in confraternities that were independent of the established churches. The confraternities, which provided community services such as burials and welfare support, often had meeting rooms where their musically accompanied devotions had a strong ritualistic content. 'Several paths lead to God; I have chosen that of dance and music. ... Then both the singers and the instrumentalists of Doulce Mémoire practiced these invocations [of the Muslim orders, the Ṭarīqah,] standing in a circle in the refectory at Fontevraud's abbey, aiming to adopt the appropriate mental and physical attitude. 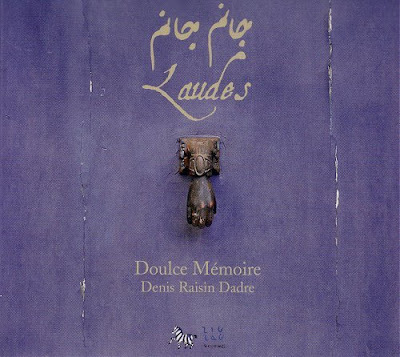 We very soon forgot we were recording a CD, and came under the spell of what musicians of the 16th century called 'l'efficace', that is to say the effect produced by rhythm and headily captivating melodies. Wilhelm Furtwängler and the forgotten new music here. One of the casualties of the demise of Point Music was their 1995 recording of Gavin Bryars' Cello Concerto Farewell to Philosophy and its couplings which feature both percussion ensemble Nexus and Charlie Haden. Starting from G. Bryars let’s go back to the real Lasso. I’ve been bying CDs with his Music for many years. “Viersprachendruck” – motetten / Madrigale/ Chansons/ Lieder. An amendment to my declaration of interest. I said that our overnight accomodation was paid by me. But after I complained about the lack of heating, lukewarm water, broken sink fitting, single portion of tea supplies etc etc in our room at the Maylebone Travelodge I received a full refund of the accomodation cost. Now I'm going to write to National Express about the people who insisted on using mobile phones and audio equipment in the 'quiet carriage' on both legs of our train journey from Norwich to London. Always an interesting read, these pages: so worth visiting! Never pedestrian or dull though not always to my taste, but that’s another matter. Can I just correct you that Gavin Bryars Jesus’s blood.... has indeed been played in London in the last 15 years. It was performed by the London Sinfonietta at one of the concerts for the inauguration of King’s Place. Can’t remember the date offhand but it must have been in the last 18 months or so. I know because I was playing in it! Clive, thanks for that correction. The 'first performance for over 15 years' came from the publicity for the Gavin Bryars Ensemble gig! A case, I guess, of Gavin Bryars' memory just failed him yet.